Chemical weapons are horrendous agents. Small amounts can kill and severely injure hundreds of people in a matter of minutes, as apparently occurred recently in Syria. Some analysts consider them “poor countries’ nuclear bombs.” The international community has, with the Chemical Weapons Convention, banned their use, development, production, acquisition, stockpiling, retention, and transfer. Nevertheless, several countries have continued to develop, produce, acquire, stockpile, retain, and transfer these weapons. Chemical weapons were used on a wide scale during World War I and were also used during World War II. Saddam Hussein used them in Iraq in the 1980s to crush internal opposition to his regime. A terrorist cult in Japan used them twice in the mid-1990s, killing 20 people and injuring hundreds. Now they have been used in Syria — maybe more than once. Their use in Syria cannot go unchecked. But that is not the issue before the US Congress. The issue is whether or not President Obama should authorize the “limited” use of cruise missiles, launched from US ships in the eastern Mediterranean, to “degrade” Syrian President Assad’s ability to launch additional attacks. There are three reasons why we oppose such a strike. First, such an attack by the United States would likely violate international law and undermine the United Nations’ ability to enforce the Chemical Weapons Convention. The report of UN weapons inspectors who investigated the recent attack has not yet been issued. The United States does not have the right to enforce international treaties — militarily or by other means. Second, a strike by the United States would have uncertain consequences within Syria. It is likely to kill and injure noncombatant women, men, and children. It may lead President Assad or others in Syria to use chemical weapons in retaliation. And it may lead to wider access to the massive store of chemical weapons there, leading to further use of chemical weapons in Syria — and beyond. Third, and most importantly, such a strike by the United States would have uncertain consequences throughout the Middle East and beyond. It could lead to a much wider war in this region, where there is an overabundance of weapons supplied by the United States, Russia, and other countries. Such a strike would be equivalent to tossing a match into a barrel of gasoline. There is already much conflict in this region within countries, most prominently within Egypt and Iraq, and there is much potential conflict between countries. The reaction by several countries and non-state actors in the Middle East (and beyond) to a US strike cannot be predicted, but there is a predictably high likelihood of a miscalculation, or a whole series of miscalculations, that could easily lead to a much wider conflagration. We should remember that the assassination of one person ignited World War I. The civil war in Syria, which has already led to more than 100,000 deaths and two million refugees, cries out for a nonmilitary solution. There needs to be a response to the chemical weapons attack there, but it should be an international nonmilitary response — not a US cruise missile attack that is likely do more harm than good. The suddenly increased focus on the civil war in Syria represents an opportunity for the international community to find ways to end this conflict and to promote peace in the region. Barry S. Levy, MD, MPH, and Victor W. Sidel, MD, are co-editors of the following books, each in its second edition, published by Oxford University Press: War and Public Health, Terrorism and Public Health, and Social Injustice and Public Health. They are both past presidents of the American Public Health Association. Dr. Levy is an Adjunct Professor of Public Health at Tufts University School of Medicine. Dr. Sidel is Distinguished University Professor of Social Medicine Emeritus at Montefiore Medical Center and Albert Einstein Medical College and an Adjunct Professor of Public Health at Weill Cornell Medical College. 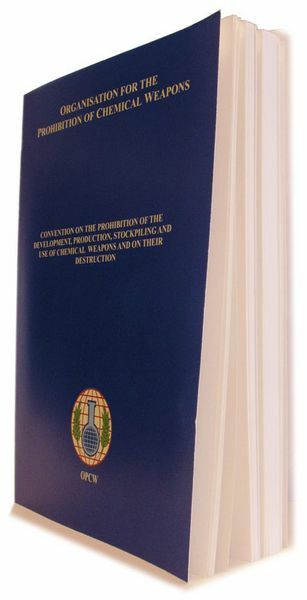 Image credit: Cover of the Chemical Weapons Convention used for the purposes of illustration via opcw.org.